Harald Tunheim made history and Dallas Seavey leads the FL-1200 race, increasing the distance to Thomas Wærner who has a dog in his sled on the way to Kirkenes. Reports from our expert Nina Skramstad say that both Seavey, Wærner and Birgitte Næss, who is currently #3 in the race, have fresh and energized dogs. In other words; nothing is certain, even though the American appears to increase his lead. The lead pack of FL-1200 are expected at cp Kirkenes around 21:00 CET. This is a bit later than expected, and is largely due to the amounts of snow on the trail, which slows the teams down. Further back, the rest of the field is beginning to be stretched thin. Can 2016 Champion Petter Karlsson, Kristian Walseth or John-Erik Eriksen catch up with the lead pack consisting of Seavey, Wærner and Næss? The leg from Kirkenes westwards towards Varangerbotn may reveal just that. 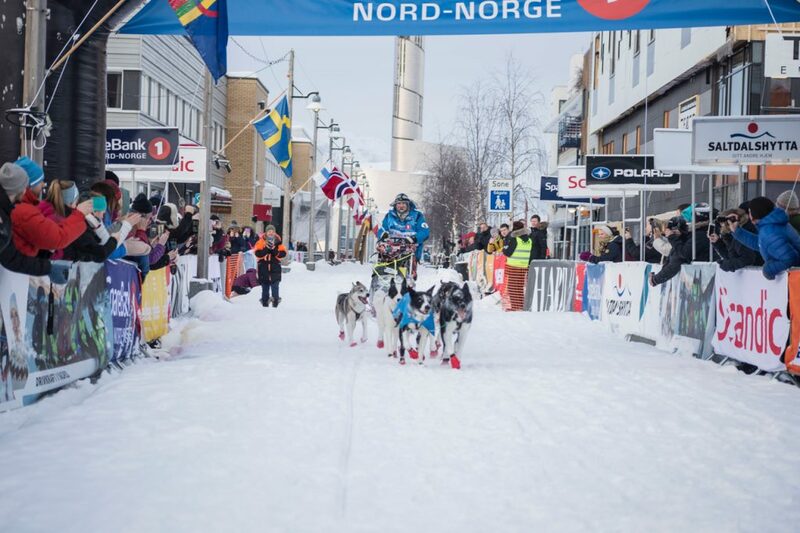 HARALD TUNHEIM WON THE FINNMARKSLØPET 500 KM AND SECURED HIS SIXTH WIN IN THE FINNMARK RACE! In the morning rush hour in Alta, musher veteran Harald Tunheim (59) appeared and could add another FInnmarksløpet victory to his already extensive mushing CV. Tunheim is one of the true pioneers of long distance mushing in Norway. He joined his first Finnmarksløp in 1989, at a time when the current standings list was transmitted to newspapers via smoke signals and headlamps looked as if they had been stolen off a truck. Finnmarksløpet 30 years later is a quite different story. It is the story about how Tunheim gave his victory interview while on his sled a couple of miles before the finish line – streamed live via Facebook – with followers from New Zealand, the USA, Germany, England and the rest of the world. Click here to see the live on-the-sled interview with Harald Tunheim, 8 minutes and 45 seconds into the clip. – It has been a great trip across the mountain from Karasjok. I have thoroughly enjoyed myself. 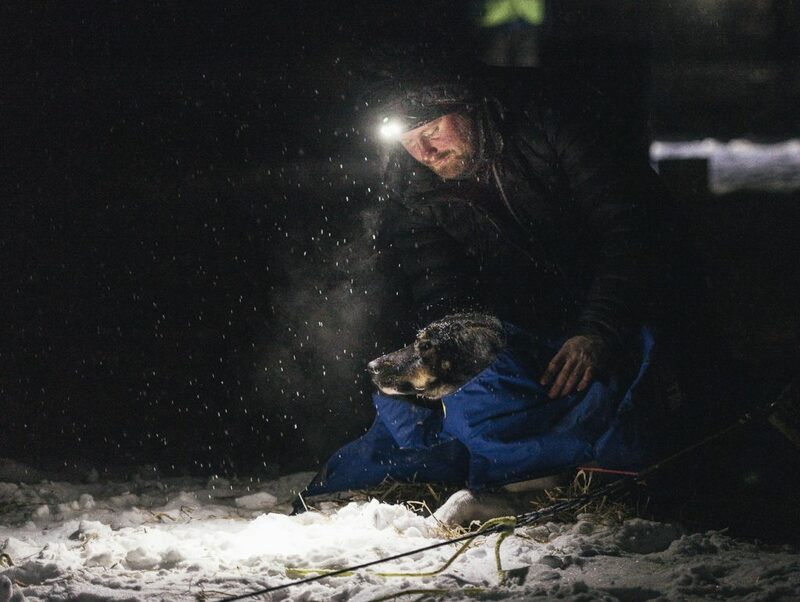 Having most of the job done before the last leg commences is what everyone dream about, said a happy Tunheim when giving us a lift on his sled along the Alta river, less than an hour before he crossed the finish line. The musher was in a chirpy mood, being in a league of his own during this year’s race. Though it has not been only a walk in the park. When leaving Valjok checkpoint yesterday, his dogs demonstrated to the entire country through live TV broadcast what an unscheduled mating looks like. And last night his sled fell over. – I was really, really tired, the happy musher admitted. He comes from southwestern Norway, however, he has lived in Alta for more than 40 years. Perhaps no wonder that the tired musher requested a refreshing glass of champagne while cruising down the Alta river. He answered questions submitted via the livestream on Facebook, where someone wondered what it is like for an experienced musher with lots of [former] FL-1000 experience to race only half the distance this time. – I give it my best when I start a race, whatever it is. I give my all in this FL-500. It is super-exciting and puts me to the same tests and challenges; both races contain the same elements, he states.